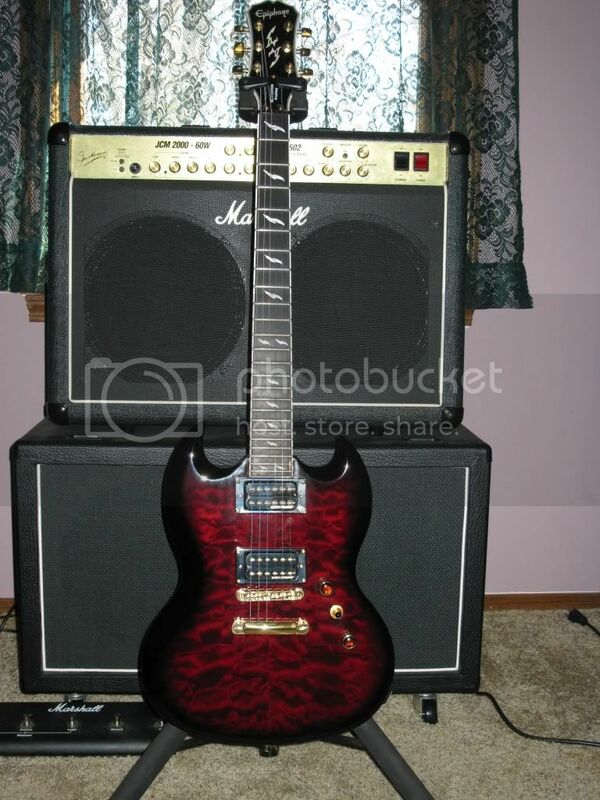 http://www.kellyindu...gibson_sg3.html I hope you can appreciate the specs. and review. Here's some newer pics. I can't clean up the pickup covers the way I want to. Suggestions have always involved a solvent that would ruin the finish if an accident happened. Suggestions are welcome. I may need new covers? looks nice rew, is the headstock gold or is that a reflection ? 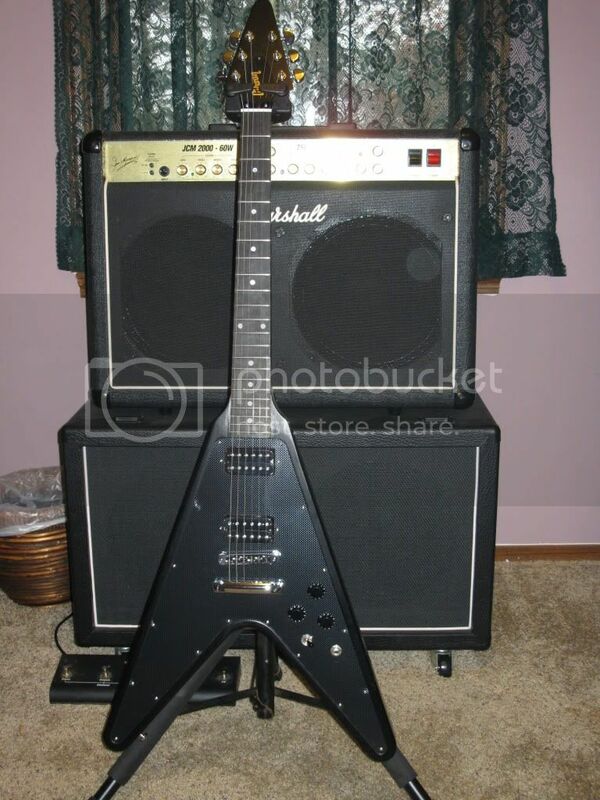 That amp must be a beast rock star, is this the same amp in this review link? Thanks Tom. The headstock is just showing a reflection. I'm not much of a photographer. I think your right about the pup covers. I'll just replace them next time I change the strings. MF sells them for about $23 ea. Actually Sweetwater has them for $16.29 ea. I like Sweetwater better anyway. I love my Marshall. It is the 60W version of the amp in your review link. BTW when I add the B-52 2x12 cab to the combo amp it sounds like a true half stack. Look at my sig. There is not a lot of difference in volume between 60W & 100W. There are a few more features on the 100W combo but I couldn't justify the price diff. when I bought it. Here's links to specs and reviews. Peace Bro and Keep On Rockin!!!! Hey Tom What's up shredder? I know this is the SG-3 post but have you seen pics of my Epi Prophecy and my Gibson New Century Flying V? Two great axes. The Prophecy has Grover tuners, 24 frets, ebony FB and graphite nut. It plays awesome for an Epi. My V also has Grover tuners, 22 frets, and ebony FB. (1 of 400). Here's a looksee and I hope you like. Talk to you later. Rewd. P.S. I will delete this post after you get done looking. I'm not trying to hijack your thread. Btw Keep On Rockin Bro!!! no don't delete it this is everyones thread here..
yeah i like that epi, that has the dirty fingers pickups, i think they used them in "the paul""....that guitar had a walnut body and neck.....if you ever see one try it.......I always wondered why they would not put the gibson pickups in the epi....seems just silly, the finish on the one i played was like it was dipped in glass, real smooth..buttery, if i didn;t have the sg 3 in my scope i would have bought that guitar.. Thanks Tom, I really like that Epi Prophecy SG GX. Those DF pups really smoke. They have a little more bottom end than the 500T pups and they are a little hotter. It also has coil split and when split in the bridge pos. it sounds alot like Blackmore's Strat when he played with Rainbow. My V is a guitar of the week model. Made in 2007 week 31. Here are the specs http://www.gibson.co...V_New_Century/. I really like the sound of that guitar also. It also is a great guitar for hard rock and metal and has a cool clean sound. That's the first V I have ever owned and I love the weight and upper fret access. Before you sell your LP. I would check out a Night Train, Tiny Terror or Blackstar. They are all great little tube amps that come in combo's and won't break the bank. You could probably trade your Spyder in and knock a nice chunk off the price. Later on when you have a little more cash you could get a Vox Tonelab ST for $200 and get all the effects you probably need and you don't lose your tube tone while using it. Check one out they run off of a tube W/ Valvetronics technology. Every person I have talked to and owns one really loves them. As a matter of fact some guys run it thru their SS amps and get a tube tone with it. Could be an aletrnative to buying a tube amp at this time if cash flo is a prob. Let me know what you think. My only concern is you may like the tone of your LP later on and you can always swap pups in her if the tone isn't cutting it for now. New LP's are only going to go up in price later on in life. Well gotta go Bro. Keep On Rockin In The Free World!!! yes epiphone was bought by gibson in like 1959 or so, you already may know, but then they used all epi parts until about 1962, after that they used all GIBSON parts in the epiphone casinos and other epi's. What's up brothers and sisters? I played my first gig last night in 2 1/2 years and it felt great. I played rythmn guitar with some local musicians. We played 70's & 80's hard rock and metal, some thrash metal and they tought me some blues. It was a real blast and will be a weekly thing. BTW I am also taking lessons now from one of the best guitarists in town. Plan to go beyond being just a rythmn guitarist. May even do a little recording if we can get a steady singer. Peace and Keep On Rockin!!!! Thanks Tom you are a real trooper. I'm not a rockstar but I do have fun playing guitar with musicians around town. I have a thread on another blog site that specializes in vintage Gibson guitars. Let's see if they can shed some light on our SG-3 guitars. Let me know how your venture to find a nice small tube amp goes. It would be a great topic in the Lounge section of this forum if you have alot of questions about various amps out there. There are members of this Forum that own or know about just about everything out there. have been meaning to ask, Do you have strap lock system for the sg 3 ?and if so , which one do you use? Yeah we have an amateur recording engineer. Still working out the kinks. If we ever get something recorded that's worthy of posting. I'll try to post on this thread. BTW I am not currently using strap locks but the general consensus on the subject is Schaller is probably the best. Using existing size screws in the same holes is recommended. Sometimes you have to go buy s/s screws and grind on them to get them to work. There are dozens of posts on the subject just look them up in the search engine. Peace Man! & remember" Rock n Roll Ain't Noise Pollution"!!!! I think it looks a bit tacky with humbuckers but simply gorgeous with single coils, i've always wanted one of these. Nice guitar wasn't that a 2007 GOW SG? How do those single coil blades sound compared to a Fender? The 3 humbuckers may look tacky to you and your opinion is welcome. We that own and play them love the sound and tone variations. I personally like the looks of them and I like the looks of 3 humbuckers on a Les Paul. Yes, you're right. It was actaully an GOTW SG Standard, but the knob layout is just like an SG-3. I should clarify on what I mean't by 'tacky'. Part of that is my own bias twords the 'batwing' style pickguards. I always had a preference for the full pickguard. The GOTW guitar has a custom-cut pickguard which makes it look more like a carefully designed instrument as opposed to just putting another humbucker in the middle. I actaully don't mind the way SG-3's with the full pickguard and without pickup rings look, I believe there was one posted earlier in the thread. I've thought a number about the plausiblity of having a custom pickguard made for my SG Special that copies the GOTW version, and installing 3 blades into it. 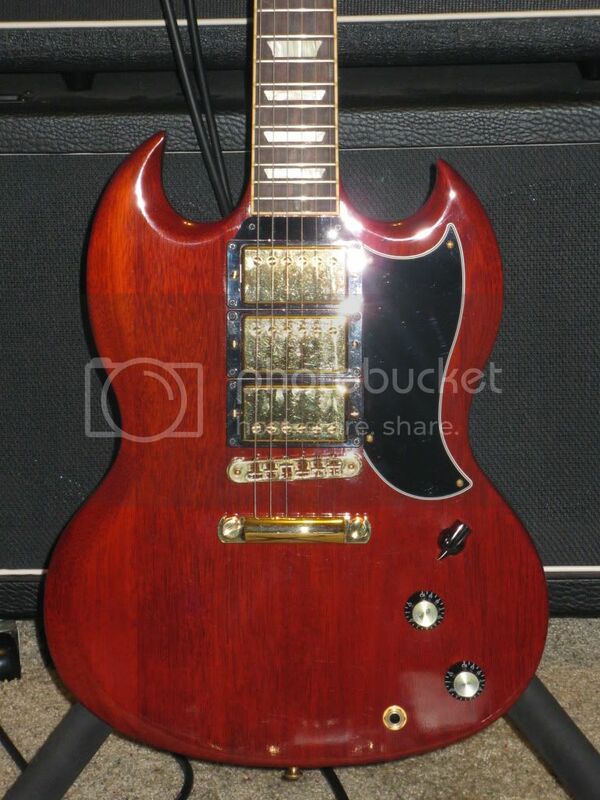 Yeah the pickguards on SG's have been discussed several times in this forum. I think the people that prefer the vintage look like the small pickguard more. I personally like either one. The chicken head 6 way switch I think is really special. Why (dare I say it) Fender uses a 5 way slider on alot of their guitars is beyond me. 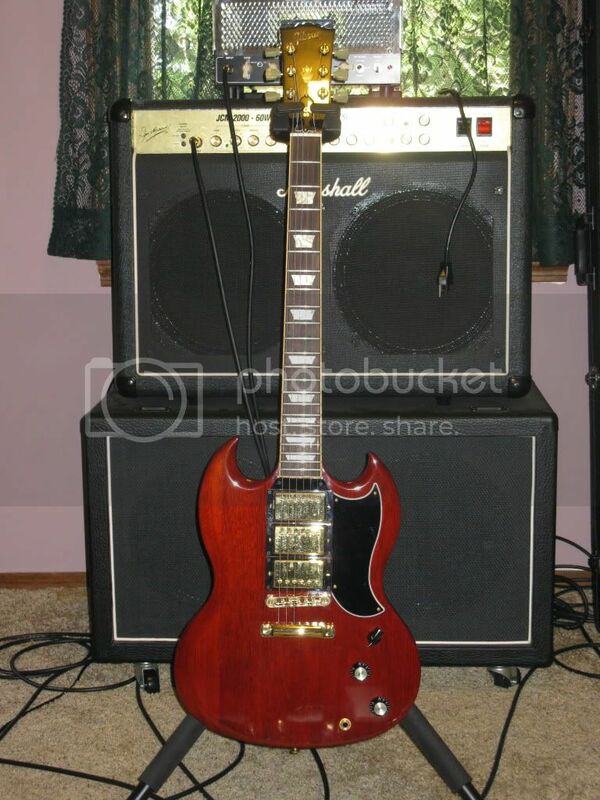 Then look at the Gibson custom SG it costs a pretty penny and uses a 3 way switch for 3 pickups. Can't figure that one out either. The great thing is that we all have our own SG's and love playing them!